SaLuSa: I know my beloved but it would have been too much for you. You had already so much stress with your job and channeling us too would have created more stress for your body as it means more energy work for you. You know this is the reason why you aren’t allowed to do readings now. I want you to focus on your healing and spiritual growth. I want you to be able to come back into my arms as soon as possible. I and all our Sirian people are waiting for our wedding (he is smiling–ed). How can I help you my love? Me: Okay. This morning I read a message that claims to be from you but it didn’t feel like your energies. It is this one read more here… I can’t believe that you should have said these words. And there is another one, a woman who calls herself NaNiYa. Read here… She says she is your twin Flame and that she receives messages from you but when I read them I am shivering from dark energies. Please can you tell me more about them my beloved heart? SaLuSa: Yes, my love. Both channelers are not channeling me but are agents from the dark side. They try to convince you that it is me but it isn’t true. And you know exactly who my true twin Flame is, it is You my heart. I have no other Twin. The cabal is happy that Mike Quinsey my channel since long years had to stop his work. Unfortunately for us he was under heavy attack and it was better for Mike and his health that he stopped. He has to recover first before he can maybe channel me again. The cabal want to introduce to you new ‘SaLuSa’ channels to spread their lies and disinformation. You are all so used to my messages through Mike that many people just grasp for any message that seems to come from me. Please be very careful, there are only a very few persons who are or have been my channels besides Mike. These are at the moment Gabriel Rayo Lunar and you. Laura (Laura Multidimensional Ocean — ed) received many messages from me too but she has other tasks at the moment. You know also that I am training our Sirian daughter Sanarta – together with Raphael – to become my new channel but it will be some time until she is fully ready. She has to get used to this work first and will receive only short messages at the moment. My heart, what I tell you now is for our readers, you know this already and are good in detecting false messages. Please be very careful in what you read. At the moment there are many ‘channelers’ who spread false messages to keep you in fear and misinformed. Read all messages and articles through your heart, feel what your heart and your body is telling you. Look at the words and the energies behind them. Are they about fear, chaos and destruction or are they of love? You don’t need to know about energies but you have to watch and observe your body, how it reacts when you read a text, be it a message or an article. Keep in mind that the dark ones are desperate and try with all they can to gain some power back. They know they have lost but like small overtired children they do what they can to avoid their ‘sleeptime’. They throw tantrums again and again. There is nothing you need to know from external sources, you have it all inside of you. Your most important source is your heart. Why do you think do we stress so much the importance of meditation and I don’t think of the classic version of meditation. I speak of your necessary quiet time, your ‘me-time’ where you can focus solely on what you do – not your job – but being creative, being with your beloved pets, cuddling your cats or dogs, watching children play, listening to relaxing and calming music, or just watching the clouds. Of course you can meditate the classic way but don’t concentrate too much on having a perfect meditation. Important is that you are quiet and go into your heart. Feel what moves you, where there is pain, injuries and thoughts and attitudes that don’t serve you anymore. Release all these energies, give it to the violet flame for transmutation and then let it go. Establish a daily cleaning and healing procedure for yourself. Close your eyes and visualize green light flowing into your body and auric field through your crown chakra, let it flow counterclockwise through your body and leaving it through your hands and feet. At first it will be leaving in a much darker color, but after a while you can see it becoming lighter until the color leaving your body is the same color as it enters your crown chakra. You can also use the violet flame, but the emerald green light of Archangel Raphael and me is also a healing light. After that visualize white light entering your body clockwise through your crown chakra and filling your body and your auric field. This will give you energies. If you want you can smoke your body and your auric field with a smoking material of your choice. It will help cleaning and strengthening your body. The more you go into your heart and listen to what you can find there – it might come through a soft gentle voice – the more you will learn. In your heart is a hidden library and you have the key to this, it is unconditional love. In your heart you will find all you need to know about ascension. Reflect and contemplate about your thoughts and attitudes. Be and do love and accept and love all you can see, feel, do in yourself and others. There is no need to fight against anything or you give energies to these situations or people. Love is the cure and answer to all questions and illness. The only one. Let go the ‘importance’ of having to know when and how things and events will happen. They will happen, but more important and necessary is that you release all your energetic baggage as you can’t take it with you into the higher dimensions and you can’t go to the higher dimensions with them. This is your mission on Earth. Release your baggage and heal yourself as nobody else can do this for you, as nobody can rescue you than you yourself. This is my message to you today through my beloved Isabel, through EnnKa how she is called on Sirius our home. She is my beloved heart of my heart and other half of my soul. It is the part in her soul that is Mother Mary who is my true Twin Flame. She is also my Twin as I am an incarnation of her true Twin Soul Silverstar as she is Golden Star. EnnKa/Isabel is my Queen in all eternity and I love her more than anybody else. Nothing can change this. 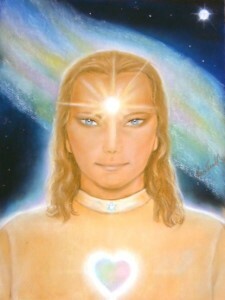 I am SaLuSa from Sirius and I send you my love and the love of the Sirian Star Nation. The cloudships you could see yesterday over the Table Mountain in South Africa were some of our Sirian scoutships. We are in your atmosphere with a part of the fleet of the Galactic Federation of Star Nations, what you know better as the Galactic Federation of Light. The ships are millions, big ones and small ones from all Star Nations represented in the Federation, they are scoutships, research ships, motherships and other kind of lightships. We will land but we haven’t got the signal yet, the green light and we will only land when it is safe for you. We can handle all attempts to attack our ships but it is your safety that has to be ensured. Don’t fall for any attempts to instigate a third World War. This will not happen as it is the will of Gaia and Creator. I say good bye now to all of you in my deep love for all living beings on Gaia and Gaia herself.